Pilgrim Rehabilitation and Skilled Nursing Center is committed to delivering high-quality care. Named a US News & World Report Best Nursing Home three years in a row, Pilgrim is accredited by The Joint Commission with the Gold Seal of Approval™ and has earned two deficiency-free state surveys during the annual Department of Health inspection. Pilgrim Rehabilitation and Skilled Nursing Center was named among the best in the state by US News & World Report three years in a row. Of more than 15,000 skilled nursing facilities nationwide evaluated, nearly 2,975 nursing homes earned the designation as a US News 2018-2019 Best Nursing Home. Only 67 facilities in Massachusetts received an overall Top Performance rating. Pilgrim Rehabilitation and Skilled Nursing Center received National Research Corporation’s 2016-2017 “Excellence in Action” award for both Customer Satisfaction and Employee Satisfaction, for the fifth time in six years. This ranks Pilgrim among the top 10 percent nationally with respect to how highly residents and family members would recommend to others and employees would recommend as a place to work. In 2015, positive feedback on National Research Corporation’s My InnerView survey placed Pilgrim Rehabilitation and Skilled Nursing Center among the top 4% in the nation for customer satisfaction for the fifth year in a row. In 2015, positive feedback on National Research Corporation’s My InnerView survey placed Pilgrim Rehabilitation and Skilled Nursing Center among the top 10% in the nation for employee satisfaction. 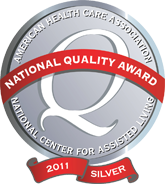 Pilgrim Rehabilitation and Skilled Nursing Center was one of the only five centers in Massachusetts to earn a 2011 Silver Award. Only 30 facilities nationwide achieved this distinction in 2011. Silver – Achievement in Quality: Applicants who receive the Silver award provide an extensive assessment of their systematic approaches, performance measures, and sustainable organizational and process results that are linked to the key customer requirements, success factors, and challenges they identified in previously earning the Bronze – Commitment to Quality award.